Nippon Professional Baseball owners have decided to set up NPB’s first for-profit corporate unit centering on “Samurai Japan” business activities. The decision was made at an extraordinary owners’ meeting in Tokyo on Friday. The owners aim to launch the company this autumn after working out specifics such as its executive structure and the ownership ratio among the NPB and 12 member baseball teams. The NPB is an incorporated body restricted to for-profit activities. Establishment of the envisaged company will give the NPB greater leeway to promote business featuring the Samurai Japan national baseball team. The company is expected to conduct marketing for Samurai Japan, and hopes are high that such efforts will strategically boost the global presence of Japanese baseball. The NPB also considered having the development of Samurai Japan business activities overseen jointly by the 12 baseball teams, in a manner resembling an all-star game. But at Friday’s meeting the owners unanimously favored the option of setting up a company, as it could allow the business to be developed more effectively and help shore up the entire baseball community, including amateur leagues. “This is a first for the NPB. 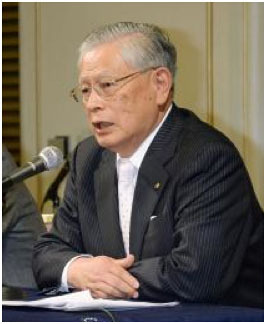 We have to make efforts to achieve our aim,” Commissioner Katsuhiko Kumazaki said.